I want to go somewhere in this autmun. Because, I get special holidays from my company. And my older son will have holidays from 7, October to 15, October. But I can’t decide to go somewhere. 1. two days trip in Japanese countryside. 2. five days trip in abroad. 3. Just stay in my house. House keeping, cleaning. 4. Give up take these special holidays. Go to work. 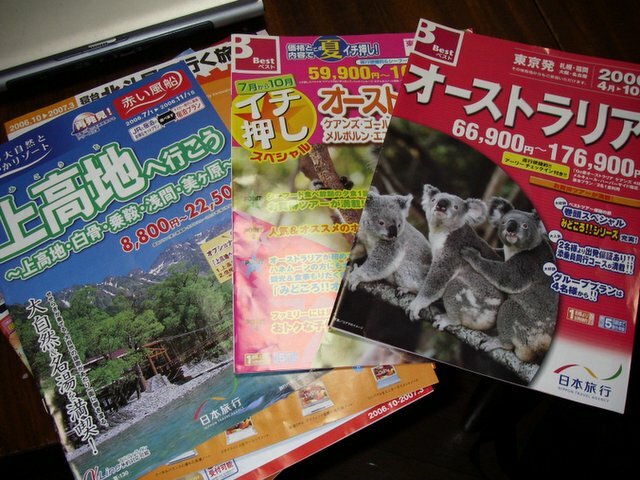 Now, I am checking the traveling list of the gold coast in Australia. Why I can’t decide it? I ask it to myself. 1. My husband is busy. He can’t go with us. 2. My younger son is so busy boy. He makes me tired. 3. I don’t know the gold coast is best place for kids. 4. I should save money for our future. 5. My mother and my brother are sick. But one more I whisper to me. If you go abroad, you will regret. 1. Next year, I don’t take autumn holidays. 2. I want to chance using English. And while I annoy, the autumn holidays will finish…. I'm sorry I posted a little thing. If you were me, what will you do? You go traveling the gold coast with your kids? The Japanese Countryside sounds amazing to me but that's coming from me way over here in Canada! You can stay home and clean anytime. I'd say travel just bring lots of little fun things for your boy on the plane. Whatever you do be certain to share the photos with us! Lucy - Forget staying home and please DO take your autumn vacation. You're too young to stay home. Go somewhere - ANYWHERE! Either of your top two choices sounds wonderful. I know you've mentioned that your mom was ill but I didn't know about your brother. And you also mentioned in your comment on my blog that you knew how to play the piano but it sits in your mom's empty house. Now it's time for your boys to learn how to play the piano! I sure hope your mom and your brother get better...sending healing thoughts to them. If I were you (which I am not) I'd go for a country trip somewhere within easy reach if anything happens to my ill relatives. Something animal or train related for the kids, nothing expensive and famous. Definitely take the vacation. Travel is great. Travelling is always a great experience. I don't know which trip you should take. Just be sure to take lots of pictures for us! On this weekend, I thought about my vacation. I realized I felt tired. Cazzie’s opinion is true for me. Therefore, I misunderstand I have to go somewhere with my sons. But that makes me tired. And, I might real want to go my mother’s house. And I might want to eat my mother’s food. Anyway, I can’t go traveling oversea on October. But I try to think about my vacation. Every body thank you so much. Thank you for link. I hope someday I want to visit your country. Thank you. My brother left ICU room. I hope he will be good. Kids like Zoo!! I think I save money. But someday my kids will leave from me.